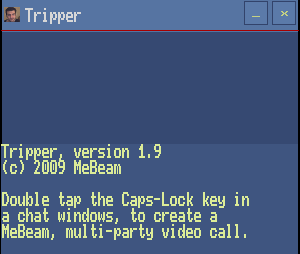 Tripper creates multiparty video calls between skype, msn, googletalk users, by simply double tapping the caps lock key twice in a chat window. Now you can have an 8 way video conference, mixing and matching friends from different networks, in a completely portable way. Participants will be send an instant link, so only the person starting the call needs to have Tripper running.